KONG Squiggles are colourful dog toys in the shape of various animals, with a long body that can be stretched. There is a squeaker at each end of the Squiggles for added fun. This toy is perfect for playing tug of war. 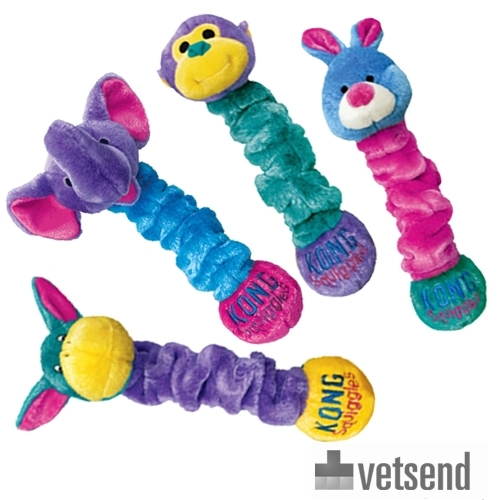 KONG Squiggles are colourful dog toys in the shape of various animals, with a long body that can be stretched. There is squeaker at each end of the Squiggles. This toy is perfect for playing tug of war and dogs can shake them to their heart's content. Please note: This product is delivered at random, you cannot select your character. You will receive one of the characters. Have you used KONG Squiggles before? Let us know what you think about this product.